Stepping through the door at Paris� famous Buddha Bar you�ll be enthralled by the charm and sense of the exotic that meanders through this large soothing space.The bar mezzanine, enlaced by 18th century style wrought-iron balustrades, looks out over the dining area where the gigantic Buddha � the bar�s namesake - sits serenely enthroned, watching diners . The amber-coloured lighting, rich mahogany furniture, Chinese and Japanese art objects, Khmer statues, decorated wood panels, lush reds and gold, luxurious fabrics and Portuguese mosaics all come together to create an opulent and refined d�cor. 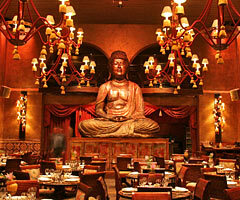 In the Buddha-bar wonderland, your taste buds travel to distant lands and inventiveness nests in your plate. The chef calls upon his charms to create a culinary art score that skillfully combines exotic delicacies with high-class cuisine. The menu offers some great pan-asian hor doevres perfect for creating a kind of Oriental Tapas, or if you want the full fine dining experience theres some prix fixe degustration options. DJ�s are always present, spinning a diverse array of amient chill out and dance/rnb hits that the bar has become famouse for. A definite hot spot for the young and trendy.